can purchase water beads that come as small hard balls. You need to soak them in water to make them grow. These are fine for bigger kids, but being as O is still putting everything in his mouth I’d rather use something he could taste. So can you guess what we used? Yup, that’s good old tapioca! How many of you remember eating tapioca pudding as a child, or frog spawn as it was more commonly known? I used to love it at home but the school dinners variety always took on a decisively chewy, rubbery consistency! 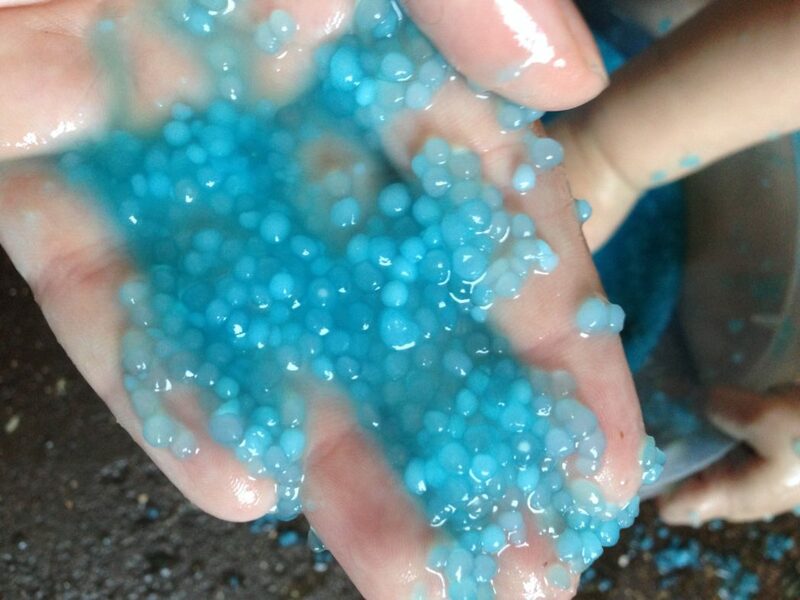 I had some tapioca pearls in the cupboard already so I was really pleased when I was perusing pinterest to see that people had been using giant tapioca pearls, the kind they use in bubble tea, to make an edible version of the water beads. I had also seen mini versions using basil or chia seeds but never anyone using normal bog standard tapioca so figured I had to give it a go and see if it worked. I didn’t make too much, just in case it turned into a gloopy blue mess. He’s not quite sure yet! 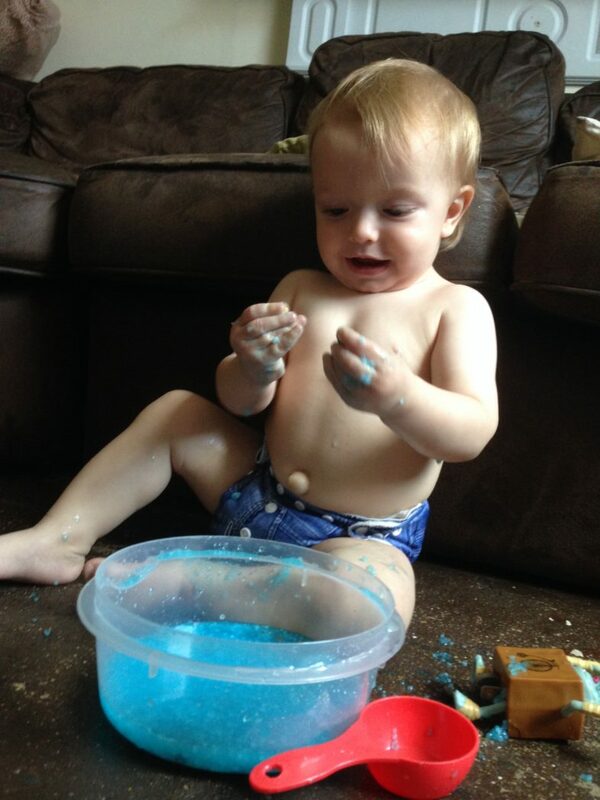 It took him a good five minutes just using the measuring cup, and he was happy enough for it to be splashed on his leg, but eventually he finally wanted one of those prized pebbles and went searching. I used some pebbles to encourage him to explore. I wondered if that was going to be it. 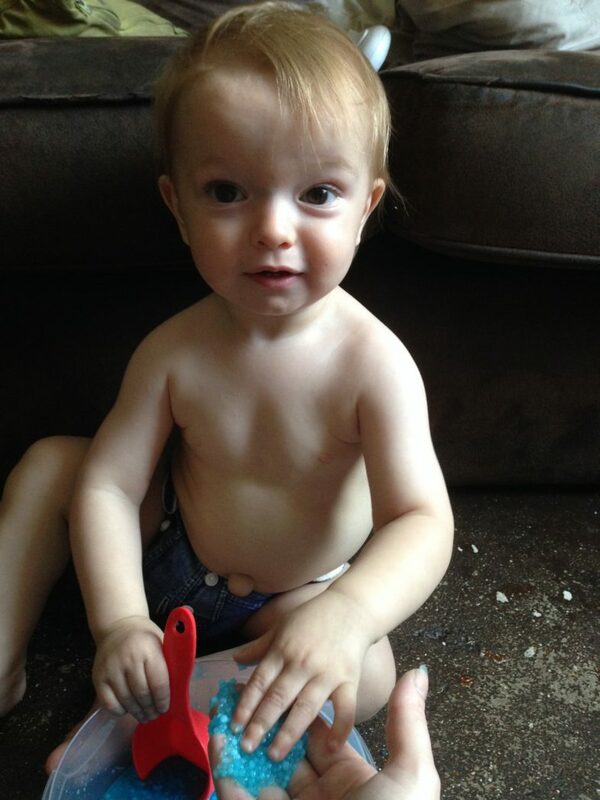 He had put his fingers in, couldn’t find a pebble, stuck his fingers in his mouth and then went back to the measuring cup. But I left him get on with it in his own time and it wasn’t long before he was having a whale of a time! I think he finally likes it! 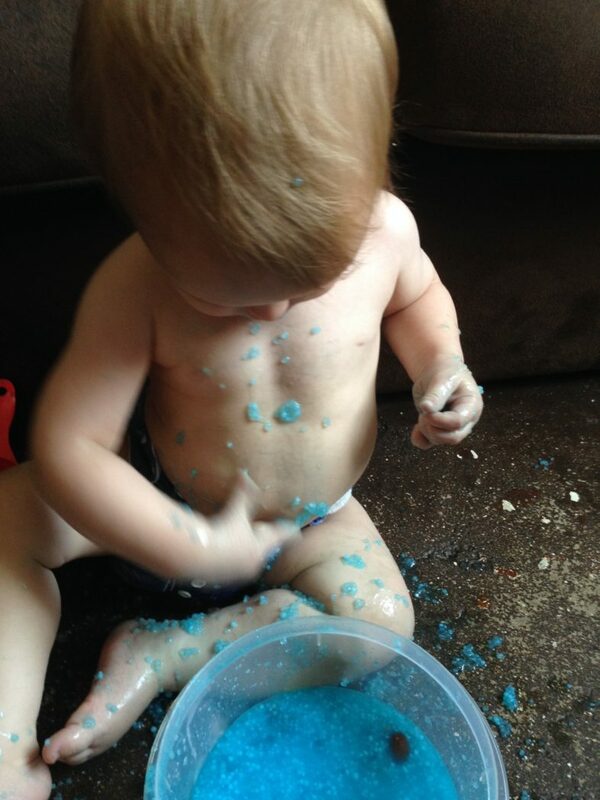 He squished it in his fingers, splashed around sending sticky, blue globules everywhere, stirred it and poured it. He hunted for pebbles, took a toy in for a swim, tried to feed the dog with it and basically had a real fun playtime. Until he got tired and then had a mini meltdown because I tried to stop him chucking the bowl! But it kept him occupied for over 10 minutes which as far as toddlers go that is a really long time! After he had finished playing the water was looking a little thick and some of the beads had disintegrated. I don’t think this is an activity that you could keep for another day but even if you made up the entire box(I used half) it would only cost approximately £1. That’s not bad if you ask me! That’s it! Just put the tapioca into saucepan half fill with water and bring to the boil. Stir occasionally to stop it sticking to the bottom and after 15 minutes your tapioca pearls will be nice and fat. Pour into a sieve and place under cold, running water. Tip the pearls into your chosen container, add as much or as little water as you’d like, I barely covered the beads, mix in some food colouring and your done! We had a great time with this activity and will definitely be doing it again! We may even invest in some of the giant tapioca pearls just to mix it up a bit too. 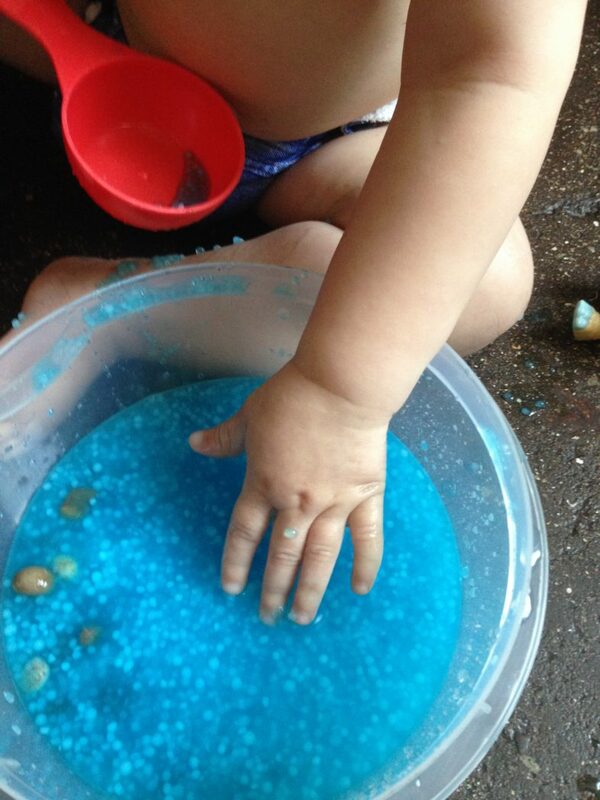 Have you used water beads with your children? Was it a success? Or is this an activity you would consider doing? This is such a wonderful idea! I have a little guy also who would love this! How was the clean up? Does it come off pretty easy? I had visions of it getting stuck to everything but actually it was quite easy. We have painted concrete floors and it just wiped up. The ones that stuck to the clean up cloths just disintegrated in the wash and the ones stuck to him disappeared in the bath 🙂 Next time I might make loads of it and put the container in a paddling pool that could be rinsed out. The only slight issue we had was his hands stayed a bit blue till the next day but that may have been the brand I used or you could just leave it out. Let me know if you try it and what the little one thinks. I bet he’d have a great time with it! 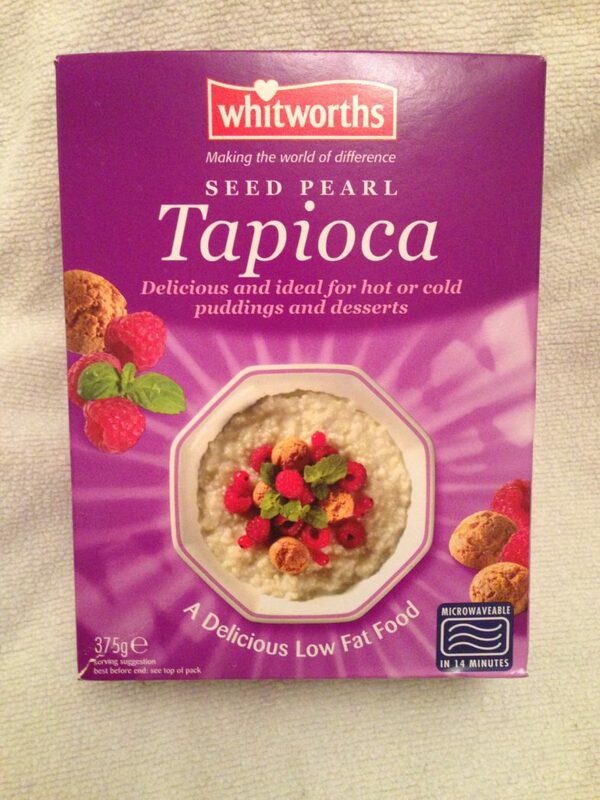 I’m off to the supermarket in the morning to buy some tapioca! Fabulous post. Thanks for linking up with #WeekendBlogHop! Let me know how you get on if you do try it. I think I had just as great a time as O did!